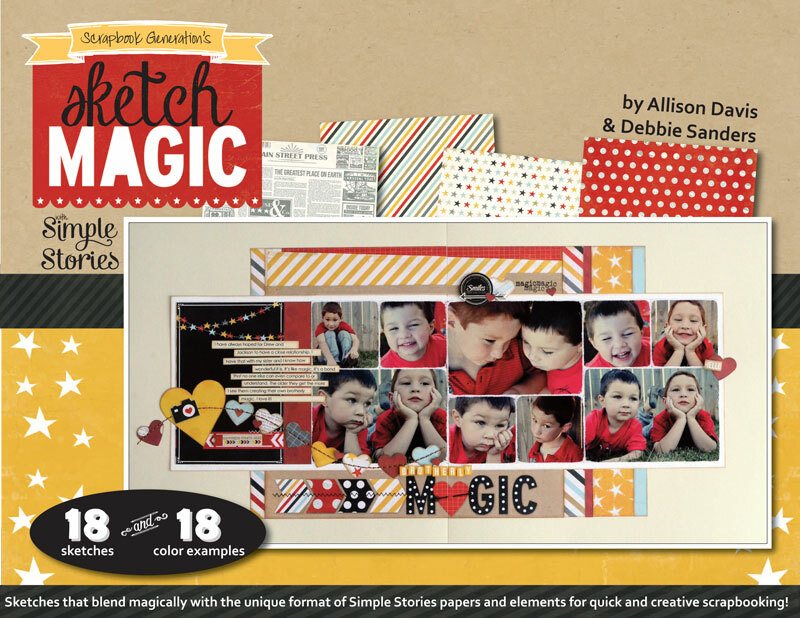 SCRAPBOOK GENERATION: 'Sketch Magic' giveaway on the Simple Stories blog! 'Sketch Magic' giveaway on the Simple Stories blog! Hop on over to the Simple Stories blog and leave a comment for the chance to win a copy of Sketch Magic by Allison Davis and Debbie Sanders. We are thrilled to once again be partnering with Simple Stories for an SG sketch book. If you love magical vacations, this book -- and the Say Cheese collection -- is definitely for you. And to make things even better, Allison and Debbie show that this paper collection is extremely versatile. Their 18 sample pages include these topics: vacations, water fun, children at play, birthday parties, senior photos, sports, graduation, and more! Click here to go to the Simple Stories blog. Final details of SG's Labor Day Weekend Sale! Labor Day deserves a great sale! Exciting change in Generation Card Kit Club! New Simple Stories SN@P at SG! New templates by Crafters Workshop! Turning a one-page sketch into a two-page layout! Go grab your free sketch download for August! Allison's popular '6x6 paper pad' class! It's like a party around here! New Simple Stories is here! New Teresa Collins here at SG and online! Check out the final Sketch Magic cover! Next new CHA lines: Teresa Collins Designs! My Mind's Eye: beautiful new collections!